As the leader of The Verge’s 2005 Pride & Prejudice fan club, I took the important step this week of watching the 1995 film adaptation of Sense and Sensibility, which apparently was shot at a time when cinematography didn’t exist. It’s no 2005 Pride & Prejudice, but it’s still a great movie even if only because it’s still Jane Austen. I also love how, a decade earlier, Hugh Grant and Alan Rickman played their love-interest analogs exactly as air-headed (Ferrars / Bingley) and solemn (Brandon / Darcy) as the later film’s stars. Check out seven trailers from this week below. The Hellboy series is being rebooted with a much more comedic tone, and Stranger Things’ sheriff, David Harbour, has taken over the lead role, providing a surprising amount of charm to the horrible-looking hero. The film appears to be a lot more like Kingsman than any Marvel movie, which is probably a good thing: Hellboy comes out April 12th, just two weeks before Avengers: Endgame. 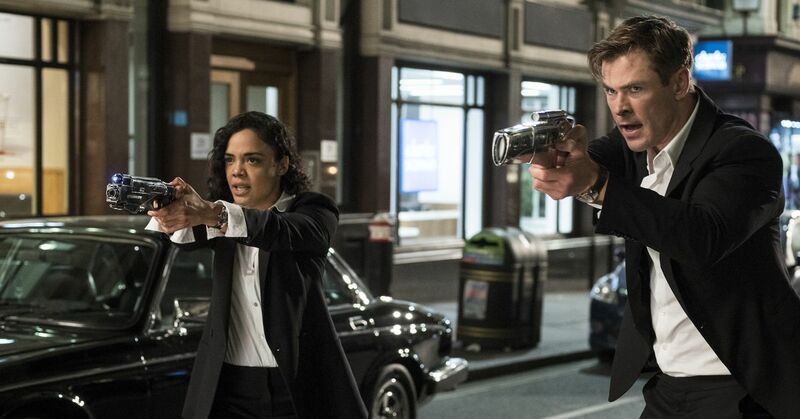 I had zero idea this movie was being made and am still pulling for the weirdo Jump Street crossover sequel, but here’s the trailer for the next installment of Men in Black, which features Tessa Thompson and Chris Hemsworth, but no Will Smith or Tommy Lee Jones. Still, “Tessa Thompson + anything” is a good formula right now. It comes out June 14th. The next film from The Invitation director Karyn Kusama is a dark, fevered crime drama that has a barely recognizable Nicole Kidman playing a detective who goes undercover and has to do and deal with some unsavory things. This trailer is brief, but the film seems to have such a strong voice and tone that you can gather everything you need to know. It comes out on Christmas. One of my favorite things about Richard Linklater’s filmography is how willing and able he is to jump around, from experimental indie films to kids movies to sci-fi. His latest jump is to Where’d You Go, Bernadette, a kind of surprisingly normal-looking movie about a woman who runs away from her family. It comes out March 22nd. Greta doesn’t look like the typical horror movie, and that’s probably going to make it all that much scarier. The film is about a young woman who befriends an older woman, only to learn that she’s being manipulated and is unable to escape the older woman’s sights. It looks unsettling in a way some CGI monster never could be. The film comes out March 1st. This actually looks kind of horrible and depressing, like a painful play-by-play of recent memory, but it stars Benedict Cumberbatch and seems to dive into important questions around Facebook, data collection, and targeting — which, a couple years later, only feels more important. It comes out January 19th. I thought this sounded so boring that I nearly didn’t watch it. But this actually looks like a very sweet, offbeat documentary about a strange niche you probably didn’t know existed: musical numbers made for corporate promotion decades ago, when I guess it was considered impressive and cool. Just watch a minute to see what it’s all about. The documentary is touring right now; a wide release hasn’t been announced yet.